We are so grateful for some expert advice on how to talk to a child about serious illness or death, something that no one ever wants to have to do. When we were faced with this situation, we personally felt overwhelmed and bewildered by this task. This week, Dr. Jennifer DeGroot Hanawalt, a clinical psychologist, provides practical, real-life suggestions of what to do and what to say to children with an ill or dying relative. You may be a parent, or helping to care for your sibling’s children, or you may even find yourself with increasing responsibility for or eventual guardianship of your sibling’s children. 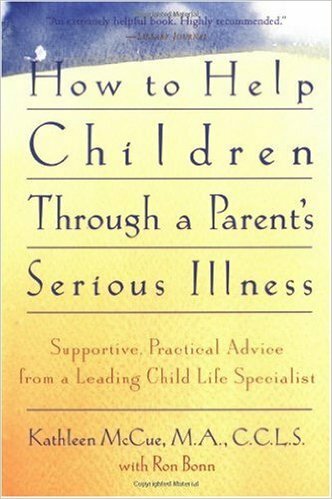 Here are some thoughts on how to talk to your children, or your sibling’s children, about serious illness and death. First, talk to children about serious illness and (if or when appropriate) death. It is essential to talk to children about what is going on. The amount of information and level of detail you provide will depend on the age and maturity of the child; however, it is important to be honest. Even babies will pick up on stress and sadness in their caregivers. Toddlers are not too young to be told that someone is sick and that you, the adults around them, the doctors and nurses, etc., are doing everything they can to take care of them and help them feel better. I have spoken to many people who remember overhearing their parents and other adults speak in hushed voices about a parent’s serious illness. When children are left completely out of the discussion, or overhear partial information, what they imagine or fill in can be worse than reality. Children may think they are to blame, expect the worst, worry about what will happen to themselves, even lose trust in the adults around them. Tell them what you feel they should know about the situation, how you expect it will affect them, and who will help take care of them (while you are busy caring for your sibling or while their parent is ill). Whenever possible, let them know ahead of time about any changes to their routine. Encourage them to ask questions and to talk to you about what is happening when they want to. Some children will not be able or ready to talk about their feelings. It is still important for them to be able to express their fear, sadness, distress, anger, etc. One way to allow this expression is through play. While playing with dolls, animals, dinosaurs, knights, or dragons, children can work though and express many emotions and thoughts that they are not verbalizing. Set up opportunities for them to play with you, and try (because you have nothing else to do!) to be present in the play with them for a bit. It can be a great opportunity to connect with them and help them to cope. Also, if you set up some sort of structure with toy figures on a rug with pillows, you can lay on the floor next to the playing child. It is almost like rest. Another way to help children to express themselves is though drawing. Provide a blank piece of paper and some colored pencils, crayons or markers and ask them to draw their feelings. If you can, sit with them and also draw or color. This can be considered relaxation for yourself, which you need as a caregiver, so now you are multitasking! Finally, it can be helpful to describe your feelings to model communication and labeling emotions. The child is probably not a licensed therapist, however, so keep it brief and light ("I feel sad that Aunt May is ill, but am glad she has so many people taking good care of her").